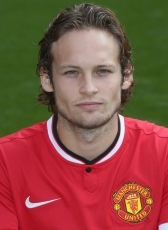 Dutch international and product of the Ajax youth academy Daley Blind moved abroad in summer 2014. He son of former international defender Danny Blind signed a 4-year contract at England giants Manchester United where Dutch coach Louis van Gaal was leading the club. Transferfee was around the 17,5ME for the left defender/midfielder. Blind has played for four seasons for the Mancunians with different success. During his stay, his contract was extended with another year to 2019. His biggest price with the club was winning the Europa League in the 2016-17 season. In summer 2018 Blind returned home to his former club Ajax to sign a 4 year contract on a 16ME transfer fee.